Now the Pentagon has abandoned its plans to develop educational and classroom materials. After meeting with Hayden and five other leaders of the committee in January, a Pentagon official declared in a March 19 e-mail that the Defense Department was shifting its mission from “education and history” to the much more limited one of thanking and honoring Vietnam veterans “for their service and sacrifice.” The official also pledged that the much-criticized “Interactive Timeline” on the Pentagon’s website would be replaced, and asked the Vietnam Peace Commemoration Committee to suggest historians who could help with an independent review of the revised version. And there were the other issues. Historian Stanley Kutler—who died on April 7, and who is best known for suing to get the Nixon White House tapes released—asked last November in The Capital Times of Madison, Wisconsin: “Will the Pentagon acknowledge the mistakes of American presidents and generals who for seven years steadily increased our commitment to more than 500,000 troops, the largest army raised since World War II? Will it recognize the growing public protests against the war, with increasing criticism in Congress, until eventually it was willing to cut off funding for the war, an unprecedented step which pointedly rejected the validity of the war?” And finally, “What will the Pentagon say to Vietnam veterans who actively criticized, questioned, and opposed the war, then and now?” One more problem: The website’s fact sheet listed the total American deaths, 58,253—but it didn’t mention the number of Vietnamese, Laotians, and Cambodians killed, commonly estimated at 3 million to 4 million. As we go to press, the old Pentagon timeline is still in place on the official website—although the entry for My Lai was changed after award-winning journalist and Vietnam War historian Nick Turse, writing at TomDispatch.com, pointed out that, among other things, the site had grossly understated civilian deaths. But the Pentagon still doesn’t call My Lai a “massacre”; instead, the timeline reads: “Americal Division Kills Hundreds of Vietnamese Civilians.” (Emphasis added.) The other materials that the Pentagon has released, however, are much more modest and limited than the department’s original announcement suggested. The official 30-minute commemoration video, Veterans of Valor, opens with President Obama addressing a group of vets assembled at the Vietnam Veterans Memorial on Memorial Day in 2012: “You came home and were sometimes denigrated when you should have been celebrated.” The country needs to tell vets that “you served with honor; you made us proud,” Obama adds. 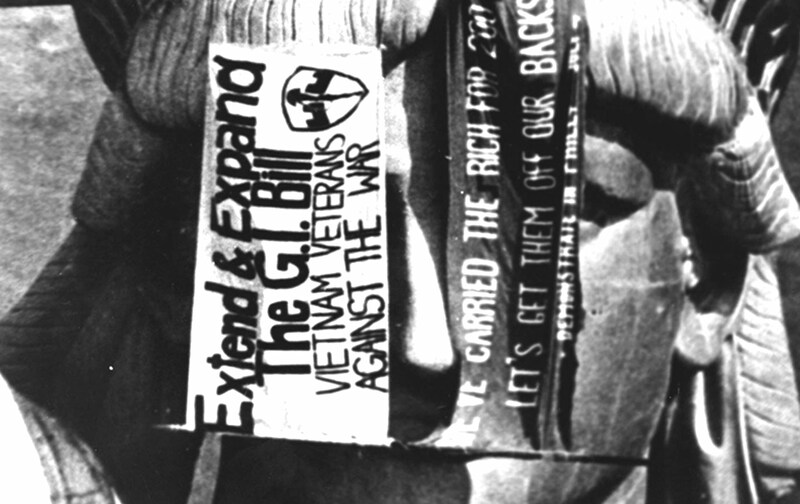 Of course, a lot of people—and a lot of vets—are not proud of what Americans did in Vietnam. The official video focuses on the daily experiences of the troops and features nine vets. They talk about their first day in Vietnam (one remembers that it was “very traumatic”; when he got off the plane, he saw “rows of coffins with American flags” about to be sent back to the United States). They describe their food and equipment, the mailbag, and the jungle where “snakes had the right of way.” They talk about the terrors of combat, and also of seeing Bob Hope and listening to their favorite songs: One says his was the Animals’ “We Gotta Get Out of This Place”; a black vet lists James Brown’s “Say It Loud—I’m Black and I’m Proud”; and another cites what he remembers as “I Don’t Get Any Satisfaction”—“We played that frequently,” he says. In the official video, only one vet refers to opponents of the war. The narrator says, “You can protest the war and disagree with the war, but the soldiers are doing what the nation asked them to do.” True enough. However, the video at that point shows demonstrators carrying a huge banner that says support our troops—bring them home. The video ends with then–Secretary of Defense Chuck Hagel, another famous veteran of the war, calling the vets “quiet heroes” who were “humble, patriotic, and selfless”—which you’d have to call empty rhetoric. After that, a series of younger GIs and veterans say things like “My generation thanks you” and “Your sacrifices were not in vain”—which most vets know isn’t true, since we lost the war. It turns out that all nine of the vets featured in the official video now work for the Army as civilians in the logistics office, which is headquartered at the Pentagon. Maybe that explains what’s missing: stories about taking drugs, handling Agent Orange, or killing Vietnamese civilians, and also anything about active-duty GIs opposing the war. But something else is missing as well. The commemorative video contains nothing about the official purpose of the war, no mention of the argument that it was a “noble” cause (Ronald Reagan’s word), a war to defend a democracy threatened by communist invasion. Apparently even the Pentagon doesn’t think that would fly today. Most startling of all, since the official video was posted on YouTube in November 2013, it has had a grand total of 227 views—and only ten downloads from the Defense Department site. The official Pentagon commemoration doesn’t seem so massive or relentless after all. On the other hand, many of the commemoration partners are Veterans of Foreign Wars posts and military bases, and some of those have scheduled big events. In North Carolina, for example, Marine Corps Base Camp Lejeune and the local chapter of Vietnam Veterans of America are organizing a four-day event (April 23–26) for what they call a “celebration” of the 50th anniversary of the beginning of the Vietnam War—which doesn’t really seem like something to celebrate. The theme of the event is not that the nation abandoned Vietnam vets; instead, there’s the revealing motto “Never again shall one generation of veterans abandon another.” The event, which will honor “all veterans, all wars,” includes a concert in the park and a breakfast aboard the USS North Carolina battleship memorial. There is space for 550 people. The public conference, “Vietnam: The Power of Protest,” organized by the Vietnam Peace Commemoration Committee, begins on May 1 with a session called “Honoring Our Elders,” featuring Daniel Ellsberg, Staughton Lynd, Marcus Raskin, Cora Weiss, and others. The second day of discussions will start with “What We Did, Why, and Who We Were,” featuring Tom Hayden, Pat Schroeder, and Ron Dellums. The speakers will address “the most common military argument you hear today,” Hayden said, “which is that the war was lost because of the domestic radicals and peaceniks and McGovern. It’s impossible for them to believe a war could be lost without a stab in the back from the home front. This has been a toxic element in American politics since the communist revolution in China in 1949 and the debate over ‘Who lost China?’” Some argue that changed in 1967, when the CIA told President Lyndon Johnson that the peace movement was not communist-controlled. But “many still see the left acting as a covert arm of a foreign power,” Hayden said. “It’s a convenient excuse”—a way of avoiding the fact that most Vietnamese saw the United States as an invading foreign power not too different from France before it. While the Pentagon has abandoned its plans to develop “educational” materials for schools and the public, that task lies at the heart of the work by the Vietnam Veterans Memorial Fund, the group that built “the Wall,” the famed Vietnam War memorial. Way back in 2003, Congress authorized the fund to build an educational center on the Mall adjacent to it. This is a huge project: 35,000 square feet, two stories underground, with a price tag of $115 million. It was originally scheduled to open in 2014, but the new target is 2019. The educational center will include exhibits on the history of the era. The Vietnam Peace Commemoration Committee’s leaders also met with people at the memorial fund, who told them the historical exhibits will be “inclusive of different perspectives.” How inclusive remains to be seen, of course, and to that end, the two groups will continue to meet. This year’s anniversary events are hardly the beginning; in previous years, there’s been a whole lot of thanking going on. Last year on Veterans Day, for example, we had a “Concert for Valor” on the Mall, headlined by Bruce Springsteen, Eminem, Rihanna, and Metallica, with special guests Meryl Streep, Tom Hanks, and Steven Spielberg. Starbucks, HBO, and JPMorgan Chase paid for it. The purpose: to say “thank you” to the vets. And the Pentagon project still has 10 years to go: The official commemoration will conclude in 2025, the 50th anniversary of the end of the war, when the South Vietnamese government surrendered and the last Americans departed Saigon in that helicopter on the roof. The organizers of the peace commemoration also hope to conclude that year, with a celebration of the war’s end. A modest proposal: This year, on the 50th anniversary of the beginning of the war, instead of saying “thank you” to the vets, we should say “we’re sorry.” We’re sorry you were sent to fight in an unjust and futile war; we’re sorry you were lied to; we’re sorry you lost comrades, and years of your own lives, and that you suffered the aftereffects for many more years; we’re sorry the VA has done such a terrible job of taking care of you. On the other hand, we might say “thank you” to the people who worked to end the war—and ask them to tell us about their experiences. We will start May 1–2 in Washington.